Some weeks ago I called for a photograph of anti-”blog people”, anti-Web 2.0 librarian Michael Gorman in a duck suit. The internet, specifically “Library Man” Michael Porter, has given me Michael Gorman dancing for peace in the blogosphere instead. Porter and I sparred at ALA 2007. We finished by hugging, and I like him more and more every day. Also, he really shakes it. Hat tip to the (recently news-worthy) Fake Steve for juxtaposing that blog title with this photo. Juxtaposing someone’s fuddy-duddy opinion with a photo of them in a Donald Duck suit is an unfair, but totally effective, way to cut the opinion down. Does anyone have a photo of Michael Gorman in a duck suit? This is a disturbing ad. 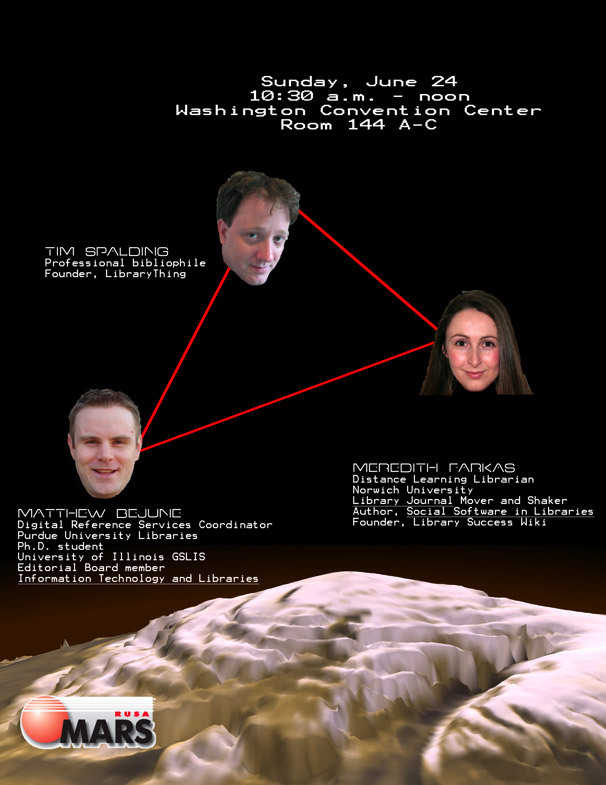 This was my introduction to a twenty-minute talk on social cataloging and LibraryThing given at an ALA RUSA MARS (gesundheit!) session called “Harnessing the Hive: Social Networks and Libaries,” with Meredith Farkas and Matthew Bejune. The meat of the talk—showing and talking about tags on LibraryThing—got all the attention (one blogger called it “jaw-dropping”). The introduction didn’t, despite attacking a former ALA president and being something of a rant. Comments appreciated! Gorman and Knowledge. Former ALA President Michael Gorman wrote a piece recently for the Britannica blog titled “Web 2.0: The Sleep of Reason.” He takes a curious starting point. At some point we discover academic journals, and our eyes are opened to just how complex and contentious and uncertain this certain thing is. And, if we go on long enough, we graduate to conferences, and we learn that knowledge is an actual conversation, with alcohol. Conversations work because, at their best, they know more and produce more than their members. They work because the knowledge is in the conversation. It happens in the very interplay of ideas—asserting, contesting, extending, simplifying and complexifying the dizzying whirl of fact and opinion, creative and synthetic, smart and dumb, right and wrong, from this angle and that. Literature works like this too, but can be even more meaningless without “conversational” context—genre, alusion and immitation and so forth. I think Gorman is wrong. But there is a lot of productive debate to be had about what digitization, mass amateurization and similar trends “do” to knowledge. There are downsides and reasons for concern. But we should not forget that the greatest thing the library has to offer—has ever had to offer—is not the relative fixity and contested reliability some now stridently set against the web, but the bubbling river of conversation it embraces. The catalog as conversation. If the contents of the library is a conversation, the online catalog is not. It is, at best, a tool to get you to the conversation. Is this the way it has to be? Can the catalog be a conversation too? When I was a graduate student, I did not usually figure out what books to read in Classics by looking through the Library of Congress Subject Headings or going to the shelf and poking around. I got them from fellow graduate students, professors and from the books, reviews and articles I was reading. *** (Like many graduate students I occasionally read a book’s footnotes looking for interesting reading suggestions and SKIPPED the text!) But I did—and do—check out the subjects and the shelf order for topics I know less about. I think that, in finding books, we ascend through a conversation. The library catalog is too often an encyclopedia, talking at you. It’s useful in the first staged of discovery. But as we ascend through a topic we gravitate to more conversational forms of discovery—reviews, articles, footnotes, bibliographies and the recommendations of others. And, I think, we leave the catalog behind. For some things, like finding new fiction, almost everyone skips the catalog right off, and reads reviews and talks to friends. LibraryThing is called “social cataloging”—one small step toward the catalog as conversation. Let me show you what I mean…. *I’m channeling David Weinberger in much of this. Indeed, if there is one thing that irks me about his Everything is Miscellaneous it is the sense that “swimming in the complex” is new. Digitization has kicked things up a notch—made us more aware of the arbitrariness of categorization, the necessity of thinking for yourself and the value of conversations—but these are old lessons. **I’ve removed the end of his quote, which hits the poets and scholars of the Museum—a sort of branch of the library—for getting paid. Still, the Library of Alexandria didn’t merely gather Greek knowledge and art together. It kicked off the fanastically allusive—that is, conversational—creature known as Hellenistic Poetry. Suddenly, the books were all together and they started jabbering at each other non-stop! Since we’re on the topic, it also deserves mentioning that the Hellenistic Age saw a shocking increase in the quantity of *bad* writing. The barriers were lowered, and a lot of junk got through. In general, the good stuff rose and the bad stuff sank. The blogosphere anyone? ***I particularly recall how one of my professors tended never to know the *titles* of books she’d recommended to me. She’d say “that new book on Athenian demes by so-and-so.” The authors were all colleagues and friends of hers. She had followed them for years. She was completely in the conversation, and it was about people and ideas, not book titles. It didn’t help that the titles in academics are often bland affairs, “aiming higher” than their obscure topic in the hope of appealing to a broader audience—”Art, Difference and Culture” subtitled, “16th-century non-guild stonemasons in Malta,” etc.